Whether you’re in the process of specifying a new-build facility or working on an existing building you need to be mindful of the regulations covering ventilation within the learning environment. This study is intended as a quick guide to the basic regulations and the McKenzie Martin products which are tailored to suit their needs. Building Bulletin 101 – Ventilation of School Buildings outlines the requirements for air changes and flow rates within school buildings both old and new. • All occupied areas must provide a minimum of 3 litres of fresh air per second (l/s) for each person at maximum occupancy. • Any sleeping/medical/accommodation areas must provide a minimum of 8 l/s per person when occupied. • All washrooms must be ventilated to provide 6 air changes per hour. • “Adequate measures” must be put in place to prevent the build up of condensation in areas with high instances of steam or fumes. Due to the ease of integrating design changes in new projects the regulations covering new schools are more in-depth than those for existing buildings. • Average CO2 concentration in all learning/teaching areas should not exceed 1500 parts per million (PPM) during school hours. • The maximum CO2 concentration should not exceed 5000PPM during school hours. 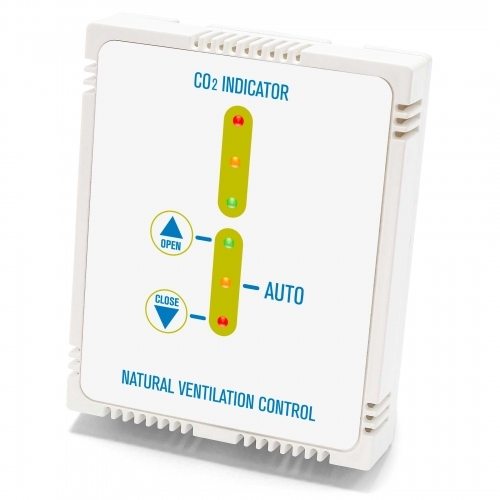 • Occupants must have the means to reduce the CO2 level to 1000PPM with easily accessible controls within each space. • Provide a minimum of 3l/s per person of fresh air. • Provide a minimum daily average of 5l/s per person. • Have the capability to provide 8l/s per person if required or requested by users via local controls. • Be calculated based on the maximum occupancy of the room/space. The regulations recommend a 10l/s minimum rate for constantly occupied office spaces. All noise level information is taken from Table 1 of Building Bulletin 93. Please note that the details shown below do not account for specialised classrooms or environments. • Noise levels within classrooms which utilise natural ventilation should not exceed 35 LAeq, 30 mins (dB). This figure applies from 3l/s minimum supply upwards. 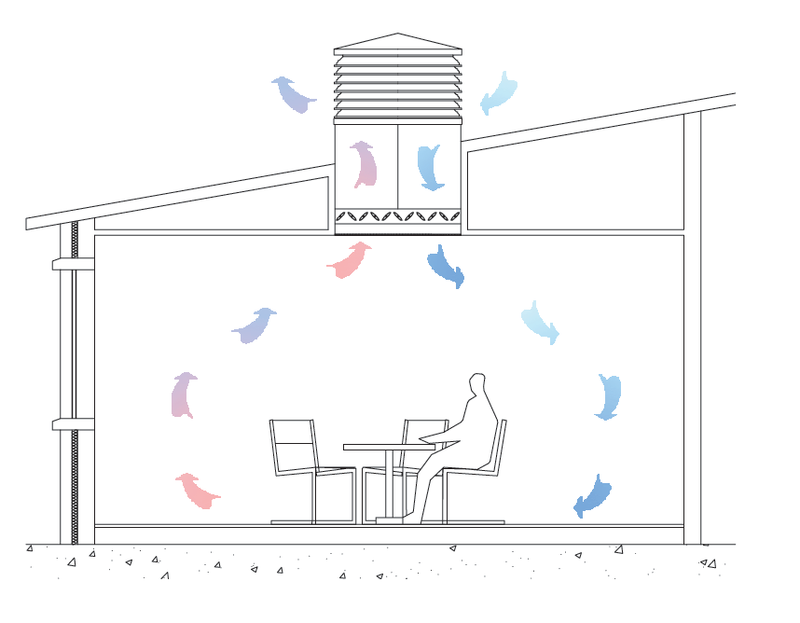 • When meeting the 8l/s supply rate using natural ventilation all Table 1 figures can be increased by 5dB. • If the classroom is used for speech therapy or for hearing impaired students then the figures shown in Table 1 apply all the way up to the maximum demand of 8l/s. 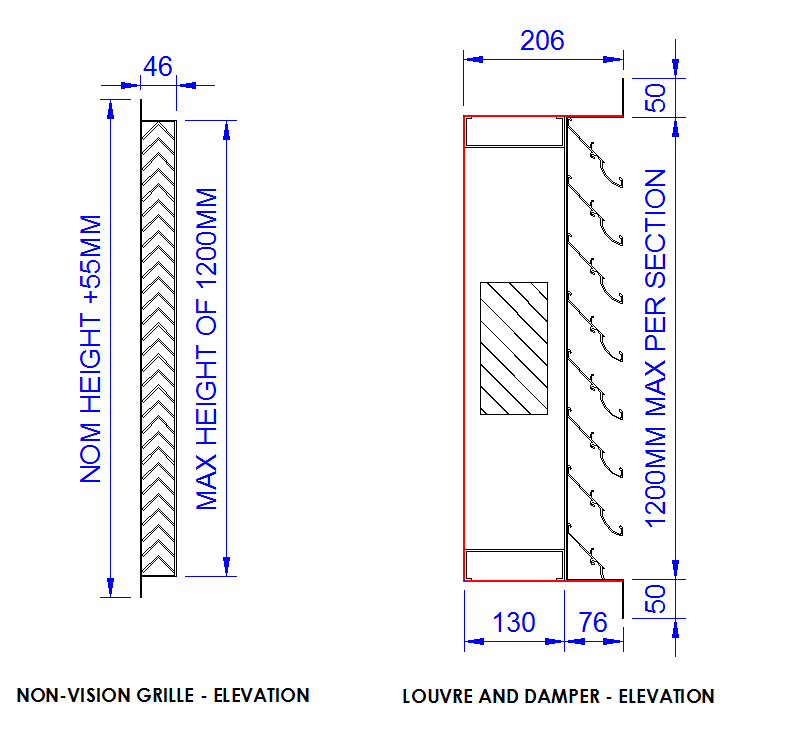 As a final point on the above, higher noise levels than those outlined in Table 1 can be accepted at the discretion of the local building authority and the teaching staff if increased noise levels are required in order to meet the 8l/s maximum demand. Guidelines on overheating apply from 1st May to 30th September. In order to conform to the regulations 2 out of 3 of the following criteria must be met by the ventilation system in place. • Classroom temperature should not exceed 28°C for a combined period of more than 120 hours during the date range shown above. • The temperature differential between outside and inside should not exceed 5°C (i.e if outside temp reaches 25°C the interior temp should not exceed 20°C). • Internal air temperature should not exceed 32°C at any point during the period shown above. 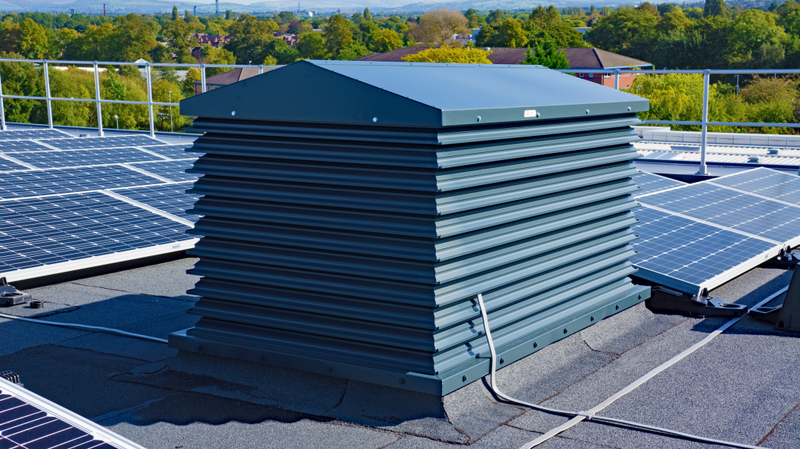 Our purpose-built, wall mounted ventilation system consists of an “A” rated weather louvre coupled with a thermally broken PVC damper and internal non-vision grille or perforated rear plate. When paired with a 24vDC modulating motor and our custom local control system the units are capable of providing fresh air intake or extract at high/low level. • Rear non-vision grille or optional perforated plate to prevent access to the moving parts of the unit by pupils or staff. The rear panel can be removed during servicing in order to maintain the units. For more information please see our Thermac page. 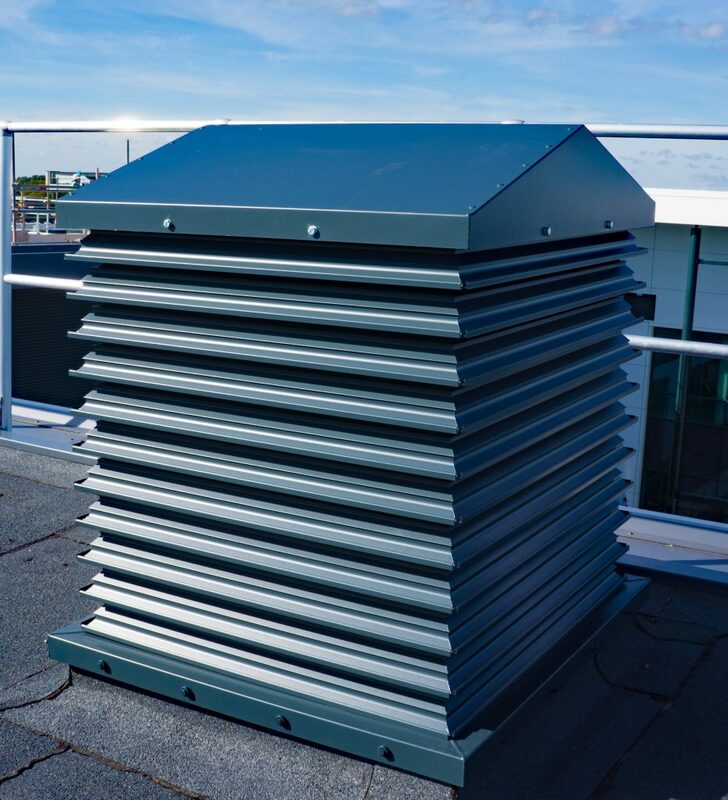 The Maximair Turret Louvre is a roof mounted natural ventilation system which utilises the internal stack effect of rising warm air, along with positive & negative air pressures imposed externally on the turret by natural wind velocity. When fitted with an internal PVC Damper, Aluminium drop duct and internal splitters our Turret systems can provide both inlet and extract in a single system as shown below. • Low leakage control damper with thermally broken PVC casing and 24v, 0 – 10v modulating actuator. • Description: High performance louvre system, A-rated in BSRIA testing and suitable for architectural purposes. For more information please see our Maximair Turret page or download our natural ventilation Turret Guide. intelligent temperature, humidity and CO2 sensors – Specifically designed to meet the HVAC control requirements of modern building systems that communicate using the open source BACnet protocol. • The unit consists of an ‘open’ and ‘close’ push button feature, and LED lights to display the selected mode and CO2 Levels. • Manual over ride mode – Unit reverts back to the Auto mode after a period of time which can be set between 30 minutes & 3 hours. PLEASE NOTE THAT THIS PAGE IS NOT AN EXHAUSTIVE GUIDE TO THE REGULATIONS IN PLACE. PLEASE SEE THE .GOV.UK LINK SHOWN ABOVE FOR FULL DETAILS ON BUILDING BULLETIN 101.